Linkle and Skull Kid in HD! Fuzzy footage of the others! HD-quality footage of Tetra now available, courtesy of NintenDaan. Hyrule Warriors Legends is out now in Japan, bringing mayhem and extra content to the portable. Though only Legends features new story content, it does - however - allow players to 'transfer' new characters to be playable in the Wii U version of the game - namely Linkle, Skull Kid, Tetra, Toon Link and King of Red Lions. It's certainly a bit of added incentive, and footage is popping up online to show how these new inclusions translate into the HD version of the game. First up we have some high quality footage from NintenDaan, showing Linkle and Skull Kid in action. Footage of the other characters is available from rips of a Famitsu live stream, but in all cases the quality is particularly low; nevertheless below is that content via Perfectly Nintendo. Finally, as a bonus, below is the most recent Koei Tecmo video of the 3DS game (well, the New 3DS version) in action. At the time of writing no details have been given in terms of the characters or extra content being available to purchase directly as DLC in the Wii U version. Koei Tecmo and Nintendo want us to buy the game again for 3DS, for obvious reasons. So, to play Linkle on Wii U you have to buy the 3DS version? @Beechbone Basically yes. Why do the logical thing and make it buyable dlc when you can make even more money? 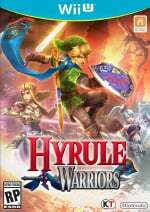 I'm a little bit tempted but really I've played Hyrule Warriors to death (haven't even purchased any DLC) and I'm not sure if I'd buy another game of a similar nature again - I might have overdone it. This is the kind of thing that infuriates me that Nintendo seems happy to do lately. They seemed like they were off to such a good start with Mario Kart and Hyrule Warriors. I paid $20 for a ton of characters and maps and modes. Now if one has no desire to buy Legends which is basically the same game they have to file out $40 for 5 new characters? Outrageous. There any word if you can also transfer Ganondorf's trident to the Wii U one? I guess I need to convince a friend to buy the 3ds version so I can get the WiiU content. The thing is, this isn't a type of game I would imagine a lot of people would double dip on. I enjoy it but it's basically one huge grind for EX. Unless there is a save file transfer, who would want to start their character level progression over again? Not I.
I hope they offer this as Wii U DLC later on, like they did with the exclusive costumes. Well that's very lame. What happens if you don't have a 3DS? Really bummed that Linkle's story content won't be on Wii U, because the 3DS port does not look like it's going to be that good frankly. I hope it comes in a update being free... No way am I paying even more than I already have. Seems from comments above that we have some unhappy bunnies. I don't believe in buying the same game twice even if the second version has additional content. That said I did not buy the Wii U version so the 3ds one is an option. But I could not get on with Smash Bros on the 3ds; to much going on for the size of the screen, this could be the same with this game. A little annoyed by them putting these characters behind a 3DS game purchase. I am interested enough to want to try them, but I have zero intentions of purchasing a 3DS/N3DS/2DS plus a game to unlock them. Especially given that the days of the platform are probably near the end. I don't have a 3DS, so I guess I'll just have to wait and see about more DLC for Wii U - surely that would make more sense anyway? I mean if there's a big fanbase that owns both machines then they won't buy the DLC anyway, but I doubt every Wii U owner also has a 3DS and vice-versa. They should release this 3DS content on Wii U for a fee. @stocko No linking involved, just a simple case of the game comes with a download code for the 3DS characters on Wii U. @RadioShadow @Darknyht You don't need a 3DS. If you really wanted to you could buy the 3DS game, redeem the code it comes with and then sell the 3DS game. They should release all of legends content as dlc on the wiiU. I'm not buying basically the same game I already own on a weaker system just cause no one likes wiiU owners. If Nintendo does not add the legends portion as paid DLC for Wii U... Then we will know for sure that Nintendo does not want my money... I don't do 3DS! Hmm As someone who's got the Wii U version I'm really looking forward to the 3DS version as I can totally see this being a blast out and about and I'm looking forward to the new content! Personally I know people are upset about the fact you need the 3ds version to get the extra characters but like @Grumblevolcano said you could sell the game after you redeem the code on Wii U. Another point is the fact that even if they did release these characters as dlc on Wii U honestly how many would buy it? I can see the incentive but it's not like smash Bros where there's a whole online to use the characters in and there's no new missions most people who play the Wii U game are finished by now and as such wouldn't get some new characters to play as once or twice and then to put the game down again due to a lack of new content. Anyway I think Nintendo plan to release it after a while giving the 3ds version some time to sell! @DoctorOverbuild well that's partly why I said they should just release all of legends content as dlc on the wiiU. I'd probably pick up the game for a while to play through that and use some of the new modes and features. Interestingly I wonder if we'll get a situation where there's tons of used copies with a now invalid code filling up warehouses. @Lady_rosalina yes it would but trust me there will be people who do get this just for the Wii U dlc and Nintendo knows this! @Yorumi Trust me there'll be a lot with people just getting it for the codes and others with a normal 3ds being disappointed with the performance and others in general who didn't like the game but still used the code haha I'm really looking forward to this game though! @DoctorOverbuild yeah I'm more just miffed that, other than performance, the superior version of the game is on the handheld. You just generally don't expect the more expensive console version to be the inferior one. Not bothering with the 3ds game. I don't like games like that on 3ds as my 3ds is my rpg machine primarily. If they won't give us everything in this game as DLC on the Wii U, then I just won't get this content. Thankfully Hyrule Warriors has enough content in it already, at least more than enough to make me satisfied with my purchase. If I was betting, I'd say the DLC will come after the initial launch of the 3DS game. It would be nice if Nintendo had an official statement about it, surely they want you to give the 3DS game a shot with a litlte extra incentive. Honestly I think the game will play pretty well at least on the New 3DS and I don't generally like playing on the dinky thing. Anyway, the DLC would sell nice and clean and easy and digital after the launch period of the 3DS game is over, so I don't think Nintendo would let that opportunity slide. Also, Linkle is pretty great and I want to see her in more games now. Love the dual crossbow moves. @Yorumi Exactly and the new 3ds seems to run this game pretty good too in 3d which is a bonus! The fact you can take it on the go is pretty awesome but the fact it makes getting the console version rather pointless is crazy indeed! In the 3ds version you get all the season pass content and the game is around the same price of the Wii U verison without the dlc which is just insane, people won't want to get the Wii U versions season pass if the 3ds has all the content! I am guilty of owning the Wii U version, all the DLC and also preordering this. But I genuinely just want to be able to play it on the go on my New 3DS, I'm not just doing it for the extra characters (although they are a welcome bonus). Ew, she isnt hawt or kewt at all. Linkle looks like some inbred version of Link. She def isnt Samus, thats for sure. Also, the name Linkle is stupid, imo.